FILE - Multiple apps are displayed on an iPhone in New York. Some two-thirds of the world's population is expected to settle in urban areas by 2050, according to the United Nations. The trend presents an environmental challenge, given that the world's cities account for the bulk of greenhouse gas emissions. Not only will the app measure a trip's emissions and suggest alternatives, it will provide the data to cities and urban planners working on systems from subway lines to bike-sharing programs, said Jonathan Whitworth, chief strategy officer at Greenlines Technology, which created the app. "As you would imagine here in Canada, especially Western Canada, most people are driven by the environmental side of it," Whitworth told the Thomson Reuters Foundation. 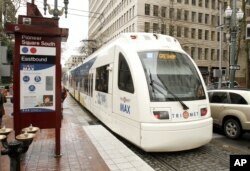 FILE - A Tri-Met light rail train rolls through downtown Portland, Oregon, April 11, 2012. "People are starved for good information and data for good travel choices," said Sperling. The app's suggested route is a cowline - city planner parlance for the fastest route, said Whitworth. In pastoral settings, a cowline is the most direct path cattle use to reach grazing grounds. While other apps such as Changers CO2 Fit track users' carbon footprints, Cowlines claims its methodology, certified by the International Organization for Standardization, is most accurate, he said.